First, a little about my background writing tie-ins. I’ve published over forty novels. Twenty of them have been tie-ins. I’ve also written a number of short stories that are tie-ins as well. I’ve written tie-ins based on roleplaying games, videogames, movies, and TV shows. I’ve done original stories using licensed characters and I’ve written novelizations of films. I’ve written articles on how to write tie-ins for magazines like Writer’s Digest. I’m also a member of the International Association of Media Tie-In Writers. I’ve had work nominated for the association’s Scribe Awards numerous times (still haven’t won yet, though), and several times I’ve served on juries for the awards (never in the category I have work nominated in, of course). I think it’s fair to say that I have some experience in this field, yes? Here’s how tie-ins work. A publisher decides that they would like to produce some tie-in novels (or a tie-in anthology). They approach whoever holds the IP (intellectual property) rights. For example, I just finished writing a novel set in the Alien universe. Fox holds the rights to that property. The publisher says we would like to produce five books based on your IP. The IP rights holder says okay, it will cost you X amount of dollars. The publisher says cool beans. Now the publisher has five books to find writers for. The publisher approaches writers they’ve worked with before and says, “Pssst. Wanna write a book for us about this IP?” and the writers say yes. (Or no if they’re busy with other projects or if the advance offered isn’t enough for them or if they’re not interested in the IP or uninterested in writing tie-ins in general.) If the publisher has specific story requirements for the novels, they tell the writers. For example, my Alien novel was set between two Alien comic series featuring a specific character. So my story had to feature that character and take place between the events of the two comic series. The writer comes up with some ideas and pitches them to the editor. The editor picks one for the writer to develop into an outline. Once the outline is ready, the editor sends it to the IP holder to approve. The IP holder may say yes, no, or request some changes. If necessary, the process continues until the IP holder approves an outline. The writer writes the book, the editor reads it and suggests changes, the writer makes revisions, the book goes to the IP holder for review, the IP holder makes changes, and this process continues until both the IP holder and the editor are happy. Then the book is finally approved. The writer will have to make more changes during the copy-editing phase, but then the process is finally finished, and eventually the book is released. So given the overall process above, here are some realities of tie-writing and publishing. Publishers aren’t seeking tie-in pitches in general. You can’t simply have an idea for a tie-in and pitch it to a publisher. The publisher has to decide they want to publish tie-ins, seek out a license, get it, schedule a certain number of books, and then – and only then – are they open to pitches. You don’t approach a publisher with a tie-in idea. They approach writers only when they have tie-ins already scheduled and they need someone to write them. Tie-Ins are not a market for new writers. Publishers need writers who have proven themselves in traditional publishing already. They’ve written a number of books – usually in a genre or style similar to that of the IP. They’ve proven they can write to deadline and produce a finished novel on time. They’ve proven that they can work with editors and are open to revising their fiction as part of the editorial process. In short, publishers of tie-ins are looking for experienced professionals with a proven track record of publication. And, of course, past experience writing tie-ins is a huge plus. Simply put, writing tie-ins is not an entry-level job. Publishers don’t care if you’re a fan of the IP. If you’ve already written novels based on that IP, that’s awesome. 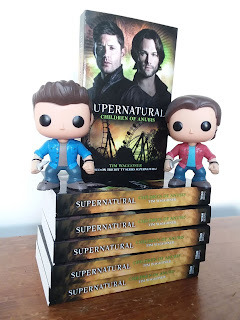 I’ve written a number of novels based on the TV series Supernatural. This makes it more likely publishers will ask me to write more of these. Otherwise, publishers only care about what I said in the paragraph above. Publishers won’t make an exception for you. They can’t afford to take a chance on someone without a proven track record when it comes to tie-ins. Writers often have only a few months to write a tie-in novel. A few as in three months. You might have been less time than that. You have to be able to do the job and do it well under these time constraints. Publishers can’t afford to gamble when it comes to this, hence their seeking out experienced professionals. It does matter if you’ve been traditionally published. I am by no means knocking indie writers here. But self-publishing isn’t the same as having experience with the process of traditional publishing. Tie-ins are always traditionally published. I suppose an indie writer could seek out an IP holder and pay to acquire a license to produce a tie-in, but who has that kind of money? Plus, IP holders are very careful about how their brands are portrayed in other media. They trust publishers with proven track records. I doubt they’d trust their IP with individual who isn’t affiliated with a traditional publisher. Experience writing and publishing short stories is nice, but publishers want experienced novelists. Short stories and novels aren’t the same thing. When I say publishers want experienced writers, I mean experienced novelists. Small-Press credits are nice, but tie-ins aren’t small-press projects. I believe I’ve only written one tie-in short story for a small-press publisher. Otherwise, all my tie-in credits are for larger publishers. Tie-in publishers want writers who’ve published with larger publishers like them. That said, depending on what sort of novels you’ve written for small-press publishers (similar to the IP you want to write for) and how well they were received (sales and reviews), they might still make a good calling card when you approach a tie-in publisher. So, given all of the above, how can you gain the necessary experience if you want to write tie-ins? Keep reading. Write and publish original novels with (relatively) large traditional publishers. You need to establish a track record in order to be considered for a tie-in writing gig. This is the only way to do that. It’s possible to get a track record in other ways, such as writing comics or videogames. That can show you have experience working with other people’s IP’s. It doesn’t, however, show you can produce quality novel-length fiction. Good agents regularly check with publishers to see what they’re looking for. If a publisher is looking for tie-in writers, agents can suggest one or more of their clients for the gig. An agent can vouch for your skills and abilities if your publication record is on the thin side, so you might not need as much experience as if you were going it alone. As far as I know, no agents special in tie-in fiction. It’s just one of the types of fiction they handle. Networking will not, repeat NOT, replace having experience and a track record. As I said in my introduction, people ask me for advice on writing tie-ins all the time. Few, if any, have landed any tie-in writing gigs afterward. That said, it doesn’t hurt to follow tie-in writers and editors on social media to learn more about the ins and outs of tie-in publishing. And if you do have significant publishing credentials, then speaking to tie-in editors at conferences or asking advice from tie-in writers might well be of benefit to you. Continue working on becoming the very best writer you can be. Despite what some people think, tie-in novels aren’t a lesser type of fiction produced by second-rate writers. You have to be a damn good writer to land a tie-in gig. So the more you do to make yourself a damn good writer, the greater chance you’ll have. So, does all this mean that it’s impossible to break into writing tie-ins? Of course not. I did it. My first tie-in novel, Dark Ages: Gangrel, came out in 2004. Here’s a picture of an inscription Mike Stackpole wrote in his 1996 Star Wars novel Rogue Squadron. I’d been trying to break into tie-in writing for several years before I talked to Mike about it at an Origins convention, and it still took eight years after that for my first tie-in novel to appear. In the meantime, I kept writing and selling my original fiction, honing my craft and gaining experience. And if you’re really serious about writing tie-ins, that’s what you should do too. Speaking of tie-in novels, my next Supernatural novel, Children of Anubis, releases later this month. And my Alien novel, Protocol, is now available for preorder. Linkage below. When an industrial spy steals a Xenomorph egg, former Colonial Marine Zula Hendricks must prevent an alien from killing everyone on an isolated colony planet. Corporate spy Tamar Prather steals a Xenomorph egg from Weyland-Yutani, taking it to a lab facility run by Venture, a Weyland-Yutani competitor. Former Colonial Marine Zula Hendricks--now allied with the underground resistance--infiltrates Venture's security team. When a human test subject is impregnated, the result is a Xenomorph that, unless it's stopped, will kill every human being on the planet. Thanks for writing this succinct article on writing tie-in novels. I'll also provide a link whenever someone asks about the subject. I'm surprised you haven't won a Scribe Award yet. I only have one finalist nomination, so I better get back to writing so I can try to catch up. Good information as always. Thanks for sharing your expertise.